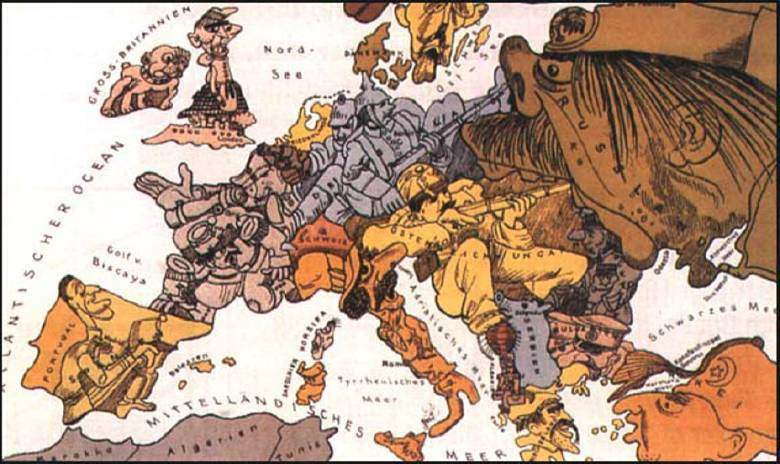 March 22, 2011 /106 Comments/in European Nationalism, Featured Articles, White Racial Consciousness and Advocacy /by Tom Sunic, Ph.D.
A German cartoon published in 1914 displaying the fear of attack from France and Russia. The advantage of Whites in North America is their racial and linguistic unity stretching from Alaska to Arkansas, from San Francisco to Boston. This unique phenomenon, coupled with implicit racial awareness, still enables America to thrive as a global superpower. White Americans, regardless of their diverse European roots, can freely use the word “nationalism” given that this word has a specific all-White European meaning on the North American continent. The issue that needs to be addressed, however, is not how the rapid balkanization of America, largely caused by the uncontrolled immigration of non-Whites, represents a threat for Whites. Rather, the crucial point is how much racial and cultural consciousness the remaining two hundred million White Americans are willing to muster. Have they ever tried? Can they? One can sport his White biceps, or take for granted his good White looks, but if historical and cultural memory is missing, Whites will simply be gradually dispossessed. Unless Whites develop an explicit sense of White identity and interests with all its necessary cultural and historical corollaries, they will continue their slide toward oblivion. One does not need millions of people to start the process of national reawakening, but one surely needs a critical mass of Whites who are well aware of their common racial and cultural roots. It is a serious mistake many Whites in America make when using the expression “White Europeans” or when talking about the “White West.” There is no such thing as one single, overarching White nationalism in Europe except when observed from the distant North American shores. There are White French nationalists, White Catalans, White Corsicans, and White Slovenes, although most of them are often historically at odds with their next door White neighbor. Therefore, drawing parallels between White Americans and White Europeans is not only false, but a non-starter. Trying to organize some White pan-European movement that would stretch from Santa Cruz in California to Novosibirsk in Russia is naïve to say the least, or still a long way off to say the best. There is a great deal of debate, often quite scholarly, among French nationalists, i.e. “identitarians”, about creating some imperial Eurasian “large space,” but seldom is there any mention as to which regional European power would serve as a motor behind this grandstanding project. Russian nationalists do not have skills or any significant mass support behind it; the Germans are politically crippled and not allowed to; and French nationalists are too sectarian in their approach. Mutual historical suspicion and language barriers are alive and well even among cultivated European nationalists, whose talking points about the “common European home” turn often into wishful thinking carried out in broken English. Often, White Americans look up in awe to the BNP in the UK, or point didactically to the case of the Vlaams Belang in Belgium, two parties often thought to be the best role models for tentative nationalist revival of White America. Wrong. It should be the other way around; it is White European nationalists who should take lessons from American White nationalists first. Unlike in the USA, the noun “nationalism” has more of a derogatory meaning in Europe, a word used for designing a specific European people — and not all Europeans at once. As a rule, each European nationalism feeds traditionally on “negative legitimacy,” which is based on the exclusion of the Other, that is, on the frequent ridiculing and vilifying of its next door pesky White European neighbor. How popular is the BNP with Irish nationalists whose agenda, although sounding nationalistic in name is light miles away from British nationalism? The BNP is virtually unrecognizable in continental Europe and even if its program is known by some, it significantly departs from the program posted for instance by the German National Democratic Party. Likewise, the influential nationalist party, the Vlaams Belang in Belgium, is well aware of the explosive racial mix in its capital Antwerp, the rising tide of minarets and the bad smell of nearby souqs. However, all Flemish nationalists are equally aware that their southern French-speaking neighbor, the Walloons, have been historically squandering loads of Flemish taxpayers’ money in order to prop up the artificial state of Belgium. In addition, the Flemings have a long historical memory and won’t soon forget how the Walloon rulers once looked down upon them as dung-infested, cow-milking boors. A young Polish skinhead, along with his young German counterpart, will be enraptured by the music of Laibach, or may even chant along some lyrics of the German band Landser. However, when the party is over, should a German skinhead with a bad hangover begin yammering about the Poland’s large ex-German city of Gdansk (Danzig), from which his grandparents were ethnically cleansed in 1945, and how the city needs to be recuperated by German nationalists, the Polish skinhead will literally go berserk and start aiming his baseball bat at the German head. The Hungarian nationalist party Jobbik has had significant success in its PR overtures in the mainstream media in Europe and it deserves to be commended. Yet, few White American nationalists can comprehend their irrational call of the soil and blood and why Hungarian nationalists are not only concerned with Gypsy crime or with their government sell-out of the national treasure to foreign sharks, but also with the fact that one third of Hungary’s historical land still belongs to neighboring Romania and Slovakia. It must be amusing to observe from the American watchtower how White nationalists in Europe endlessly quarrel about which state in their vicinity should be in charge of a small creek in Transylvania or swaths of former German lands in today’s Silesia. For Europe’s White nationalists, however, these territorial, cultural, or linguistic disputes are a matter of life and death. The list goes on and on all over Europe. The case study is a traumatic Croatian nationalism, which expresses itself, as a rule, in rigid papist ultra-Catholicism and which establishes its negative legitimacy in the endless name-calling of Christian Orthodox Serbs. A question: Can one be a good White nationalist without excluding the Other White nationalist? The savage war between White Serbs and White Croats that followed the break-up of Yugoslavia 1991 did not further the “White cause” at all; instead, it pointed out the morbidity of nationalism and racialism by default — a negative brand of nationalism that thrives as long as its lookalike Other does not fit into the preconceived Same. Thanks to the massive non-European flooding of Europe, nationalists from all European states are slowly beginning to realize who their real enemy is. Apparently, things need to get worse in order to become better. Historical memory, cultural baggage, and national mythologies of European peoples may look and sound bizarre to a certified American White racialist whose quest of identity often begins with IQ measurements and ends up cursing Mexican immigrants. Reading national classics in a cutthroat dog-eat-dog system certainly doesn’t help pay one’s rent. But unless wrapped up in a spiritual quest and placed into an extended cultural timeframe, White nationalism becomes a misnomer, just as each White racialism runs the risk of running out of steam. When a people slides into proposition nation it cannot legally or culturally resist for long the onslaught of foreign immigration. This is not a problem White European nationalists have to face to the same extent because their countries offer them a treasure trove of different founding fathers, hardly digestible, let alone comprehensible by non–European immigrants. However similar the scenario White Europeans and White Americans are facing today regarding the continuing danger of non–European immigration, nationalists in Europe have an advantage of being always able to fall back on their myths, sagas, and stories that sprang up from a well carved out of a chunk of land and which in times of great crisis sustain their racial and national identity. No amount of racial pride can be exhibited in abstract talks about Whiteness, unless backed up by a solid earth-bound notion of nation and state. Race, nationhood, and statehood are not synonyms, yet none of these three key pillars of identity can function alone. They must be intertwined. Each White nationalist-racialist must first have a well-defined inch of earth, regardless whether he calls it America, Germany, Slovakia, or the Northwest Republic in the Pacific Northwest. Only the territorial imperative gives meaning to the notion of Whiteness and, metaphorically speaking, the territorial imperative is an ID, a passport upon which racial and cultural identities are subsequently grafted. Every White nationalist in France knows very well what the name of Joan of Arc stands for, however mythical or historical that French lady may have been. Likewise, a British nationalist blue collar worker knows very well that the medieval name of Geoffrey Chaucer stands for a poet who set the standards for the English language. 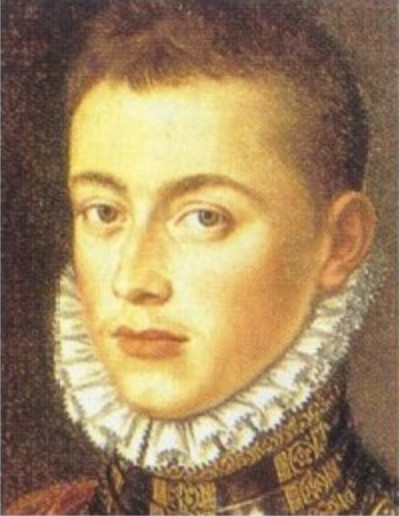 Even a yodeling hillbilly in the Austrian Alps knows the name of Prince Eugene of Savoy, a man who threw the Turks out of Europe, and every single Italian nationalist knows the importance of Don Juan of Austria, a young Spanish-Flemish-German-Italian European boy who badly battered the Turks at Lepanto. European nationalists may have never red their classics, but they know well that only with their cultural memory their nationalism can thrive. German itinerant poets, the “culture bearers,” were crucial in creating German national and racial consciousness in the late 18th and early 19th century. It remains a great mystery why White American nationalist today are not more attuned to the cultural heritage of the antebellum South. If eloquently framed, it could prove to be powerful cultural artillery for safeguarding White racial identity. Southern Agrarians of the mid- thirties of the 20th century were erudite scholars from all fields of social science and literature and in many respects their aesthetic and political visions surpassed those of their contemporaries in Europe, the so-called European national-revolutionaries or national-conservatives. Instead, the image of Southerners as toothless hicks is still widespread — courtesy of not just liberal scholars but also of many lazy Whites. The South had never experienced the egalitarian steamroller of the French revolution and therefore it had been able to retain some parts of the old European mediaeval values better than Europeans themselves. The expression “White nationalism” is a generic and false expression. Based on different European interlocutors, it can yield different meanings. Unless clearly specified within its geo-historical, linguistic and cultural framework it leads to dangerous inter-White tensions and civil wars. A White man can have an immaculate genetic heritage but if not aware of his “race of the spirit”, his race becomes worthless. So-called White racial pride without cultural pride is meaningless. Dr. Tom Sunic (websites here and here) is author, translator, former US professor in political science and a member of the Board of Directors of the American Third Position. He is the author of Homoamericanus:ChildofthePostmodernAge, prefaced by Kevin MacDonald (2007). The third edition of his book Against Democracy and Equality; the European New Right, prefaced by Alainde Benoist, has just been released.